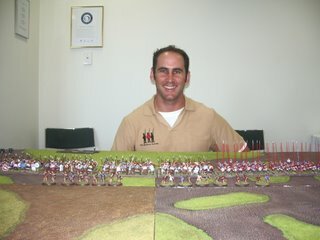 Nathan Vinson of 'Elite Miniatures Australia' who put on the game using his figures for the army of Ptolemy and my figures for the army of Demetrius. Nathan's Macedonian Pike (with red pikes) and Companions are from A and A miniatures, and his Greeks are Black Tree Designs. My Macedonian pike are Foundry whilst the two units of Pantodapoi are Essex and Old Glory. I will be posting Parthians, more Successors, Cathaginians and Caesarian Romans in the next few weeks. I will post photos of a large battle between Sulla's army and the Pontics of Mithradates when I talk one of my group into giving me a game (interested Mark! ).